David Leonard is President of the Boston Public Library, a thriving 170-year-old institution and one of Boston’s great educational, cultural, and civic treasures. David began working at the BPL in 2009, bringing with him a wealth of experience from the technology, management, and consulting fields. 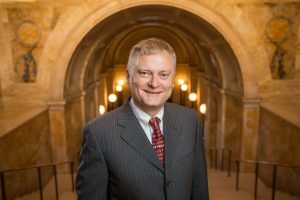 Appointed President by the Library’s Board of Trustees and Mayor Martin J. Walsh in June 2016, David’s focus is on developing the BPL as a twenty-first-century institution that provides dynamic library experiences to the residents of Boston, of Massachusetts, and beyond. BPL has a Central Library in Copley Square, twenty-five neighborhood branches, and an archival center and also serves as the “Library for the Commonwealth” of Massachusetts. In his role, David oversees a collection of more than 23 million books, maps, manuscripts, and prints, with ever expanding digital access. Prior to his appointment as President, David served as Interim President for one year. During that time he focused on the completion of the $78 million renovation of the Central Library in Copley Square, which opened in July 2016, as well as a significant number of branch and collections management projects; enhancing access and customer experience; collaborating with city departments and with local cultural institutions; and supporting Mayor Walsh’s arts and culture vision. During his time at the BPL David has also served as Director of Administration & Technology, Chief Technology Officer, acting Director of Administration & Finance, and acting Chief Financial Officer. He led the Library’s capital improvement project for the Norman B. Leventhal Map Center, worked to modernize the Library’s technology infrastructure—including the migration to the new Integrated Library System and deployment of new pay-for-print systems system wide—and oversaw master planning and design for the renovation of the Central Library in Copley Square. David’s prior experience spans academia and the nonprofit sector as well as the IT consulting world, with roles in business development, management, and technology consulting. David is currently enrolled in a PhD program in Library Information Science at Simmons College. He holds a bachelor’s degree in philosophy and mathematics and a master’s degree in philosophy from the University College Dublin. He did further graduate work in philosophy at Boston College and was a member of the 2010 Emerging Leaders Program at the University of Massachusetts, Boston.